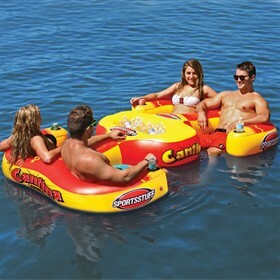 The Airhead 54-2025 Cantina Lounge is an inflatable four person lounge that features comfortable cool mesh seating with great back support for 1 to 4 people. This lounge has a large recessed area in the center that can hold sundries or ice and drinks. The Airhead Cantina Lounge has many exciting features for users of all types. See the Airhead Cantina Lounge gallery images above for more product views. The Airhead Cantina Lounge is sold as a Brand New Unopened Item.